"Show as resource" lets you treat a whole calendar as if its contents were all linked to one of your resources. This is a great way to put shared calendars in the correct rows/columns on your scheduling views. While your Salesforce, FileMaker, or Basecamp events likely have a "resource" already associated with them (often the event owner in Salesforce), your Google calendars often do not. In fact, you may have many Google calendars being shared with you and each one represents the availability of a particular person. For example, it's common that your teammates or volunteers may share their personal calendars with you (sometimes blocking out the event details) so you don't schedule conflicts with their other commitments. 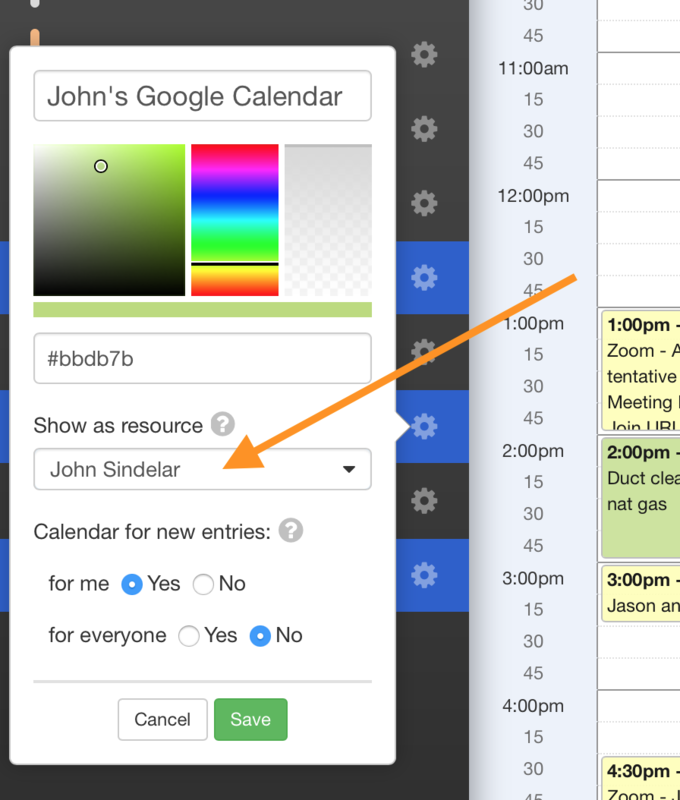 In cases like these, you'll want to take their whole Google calendar and treat all the events in it as if they were for one resource: showing "John's Google Calendar" in the "John" resource column. That way when your filter for John, or check out John's availability on the scheduling views, you'll see his shared Google events in the same column/row as his Salesforce or Basecamp events.